I have long learned that I don’t fit well into neat “hourly” grid. Still I get a pangs on of occasional curiosity about how my time at computer is spent. After long getting to it, I had finally picked a day to skim through several apps and settled on running ManicTime. It had been tracking my time for more than half a year by now. The tracking is completely automatic and comprehensive, you don’t have to configure it or give it specific instructions. All the data gathered is saved into a database file and can be viewed through interface. App comprehensive data collection and flexible reporting makes for a very strong combo. Rather than tracking of time as it happens you can retroactively see how precisely it was spent in a specific time period on one thing or another. How much time had I spent on Wikipedia this month so far? 1.61 hours! The one weak point in reporting is lack of combining across above mentioned categories. For example I primarily use Chrome browser for web development and as such I include it in “Development” item, together with related applications. But as an exception I also write blog posts in it (because WordPress admin is wonky in Opera). Unfortunately there is no way to create an item rule “this application, but not this site/document”. Rules are inclusive and need to be inside same category. Localization of interface is a little inconsistent. Some things bleed through in operating system’s language, regardless of language chosen in settings. The data is stored in SQL CE (Microsoft SQL Server Compact) file. It’s a little uncommon choice. I would have expected SQLite with its commonality and ease of getting data out. As for me free version is quite sufficient for personal use, unless you need time sheets functionality for work purposes. 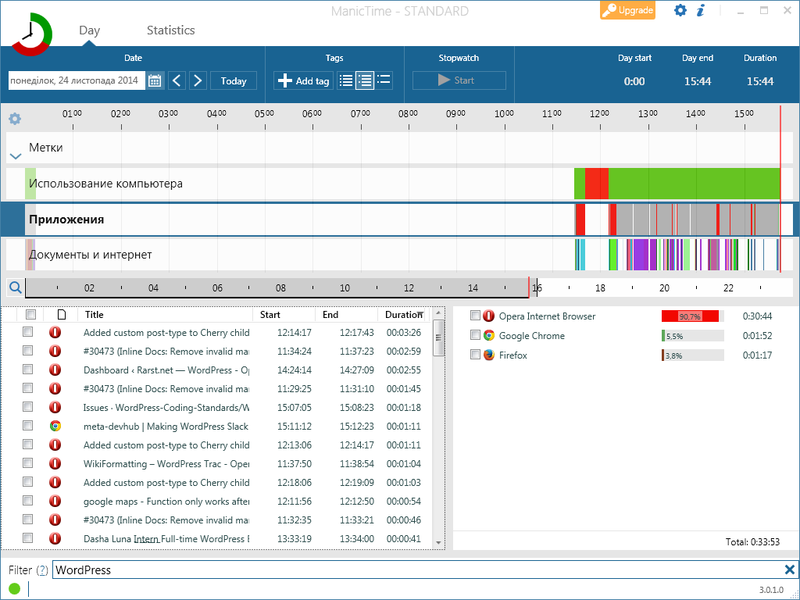 ManicTime is very well done application, with thorough data collection and reporting. I feel it could benefit a bit from some kind of dashboard view for easier overview, without digging into reports. I rarely remember to look at reports regularly, it’s just occasional activity. Available as portable version, although requires .NET Framework installed to run.